I have a JRB quilt that's rated 25F, the Sierra Sniveller. Used it a couple of weeks ago at 28F and was very warm. To guard against drafts in the end of the footbox, I inserted a spare wool sock in the hole and then cinched down the cords and tied it off (as demonstrated in one of the JRB videos). I never felt any drafts and was very warm. Seems like a very simple, effective way. I have to ask though as I can't leave well-enough alone: Is there a better way? Yeah, sell the Sniveller, and buy a TQ with a sewn footbox. Your way sounds less expensive however. I never have an issue with the JRB quilts and the footbox cinch gap. Most of the time I am using an UQP but even when I am not I can't remember this being an issue. I always use a Thermawrest Trail Sit Pad (12x16) (5 oz.) in the TQ foot box as well. Last edited by Vanhalo; 12-06-2018 at 09:13. "...in Florida, she felt air conditioning for the first time, and it was cold and unnatural upon her skin." I also just tie off the bottom of my quilt with the cinch cord (like a balloon)- completely eliminating the 1" hole (I don't use the sock). My feet have never been cold. 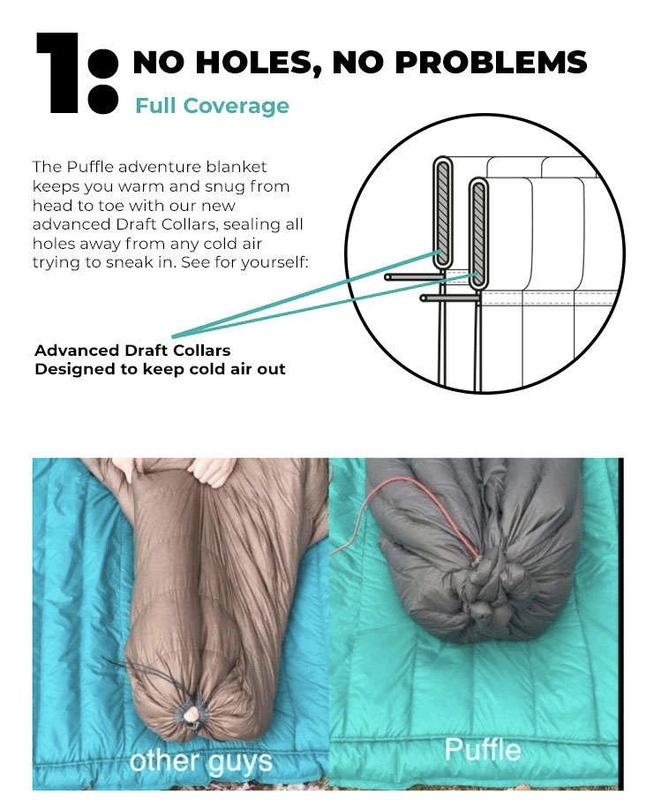 I'm sure a sewn footbox has a little more insulation in it. But since I've never had cold feet with my setup, it's not worth the added cost for me to have a sewn footbox. This is what I’ve done. Only issue I’ve had with cold feet was when we were car camping this fall, and temps dropped 10 degrees lower then predicted, and wind hit 40 mph gusts, and my tarp wasn’t pitched for it. I bailed to the tent (shudder), but I don’t blame the cinched foot box. I get the sewn foot box, but the cinched gives me a lot more versatility. Versatility comes with a price...definitely not as warm as a sewn foot box, in my experience. The sewn foot box is preferable for colder weather hangs. The cinched foot box is ok for 3 season use. The Puffle by Sierra Madre Research has a good idea, I think. But I haven’t tried it, nor do I use convertible type top quilts anyway. Thanks. I haven't been cold yet. I did the sock as a preventive since I was getting close to the rating of the quilt. I may try it next time without the sock to just see if I get any draft after I tie it off. My experiences have been great with this quilt. In fact, I think it's probably very conservatively rated. I hear people say the ratings are survival ratings and not comfort ratings, but at 28F (it's rating is 25F) I was very warm. Most cottage vendors rate their quilts for comfort. So if you order a 20° quilt from a cottage vendor, it should keep you warm and comfortable down to that temperature. If they used survival ratings, their 20° quilts would probably be rated somewhere below 0°. Warmth is very subjective- depending on how warm/cold of a sleeper you are. I used my 20° Loco Libre top quilt down to -13°F (no wind), and was toasty warm- with two pairs of wool socks. But I sleep very warm. I'm not suggesting my results are typical. But I think most cottage vendors' quilts are conservatively-rated. Foot end of the ridgerunner question.